The Lume Cube AIR is a light source that works underwater and it's cheap, too! It’s a small and affordable light source for photography and video that can even work underwater! Every photographer needs a portable light source now and again, and if you shoot video as well as stills you needs continuous lighting, not just a flashgun. And that’s where the Lume Cube AIR fits in. It’s small enough to fit in the tiniest corner of your camera bag but powerful enough for any kind of close-range photography or videography. It even has a ‘strobe’ mode that produces a brief burst of light in sync with your camera’s own flash. It follows own from the original Lume Cube, but comes with some very interesting new features. The LED output has been improved to offer what’s claimed to be the best LED specs for its size. It boasts a CRI rating of +/-90 (Color Rendering Index) which means pretty good color accuracy for a small, inexpensive LED, 5700K daylight-balanced output, 400 LUX of power at a distance of 1 metre and a 60-degree beam angle. What’s especially impressive is that the Lime Cube AIR is not just rain-resistant but actually waterproof down to a depth of 10m, so it makes the ideal companion to the best action cameras right now. The Lume Cube AIR is designed to be mounted on regular tripods or light stands, thanks to its built-in tripod socket. It’s also magnetic, however, so it can clamp automatically to suitable metal surfaces. You also get two diffusers, one white and one orange. These soften the light (naked LEDs can be a bit harsh) and the orange diffuser offers color correction/standardisation when shooting under artificial light. Also included is a lanyard and a charging cable. You can just switch the Lume Cube AIR on and off as required, but it can also be controlled remotely via Bluetooth and the Lume-X iOS or Android app. In fact, it’s possible to control multiple Lume Cube AIR lights via the app, adjusting the brightness, swapping modes and checking battery levels into the bargain. 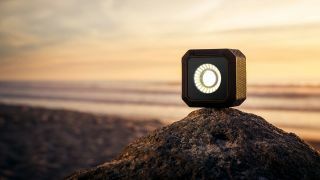 It’s designed to be the lightest, smallest and most portable lighting device for photographers, videographers, influencers and vloggers, and the Lume Cube AIR goes on sale worldwide at £53 (converted) /$69.95.